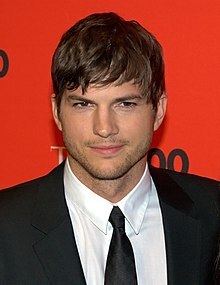 Christopher Ashton Kutcher (/ˈkʊtʃər/; born Februar 7, 1978) is an American actor, producer, investor an umwhile model. ↑ Rapkin, Mickey (March 20, 2013). "Nobody's Fool". Elle Magazine. ↑ "Ashton Kutcher Biography (1978–)". FilmReference.com. Retrieved October 31, 2013. ↑ "Ashton Kutcher". Fox19. Fox. Retrieved May 19, 2011. ↑ "Monitor". Entertainment Weekly (1245): 22. Feb 8, 2013. ↑ Kennedy, Dana (August 10, 2003). "You can call him Chris". Los Angeles Times. Retrieved August 13, 2013. This page wis last eeditit on 9 Februar 2018, at 23:25.